The last half of Tsubasa Shunraiki was released yesterday, and you can download it by torrent here (MP4 file, 252 MB). The official website of Tsubasa and XXXHOLiC OADs added a report from the after-recording sessions of the second half of Tsubasa Shunraiki with comments from the staff and cast. According to the production diary, which was also updated, there are 2 weeks left of production for the second half of Tsubasa Shunraiki. The OAD is scheduled for May 15. There are brand new SDs too! 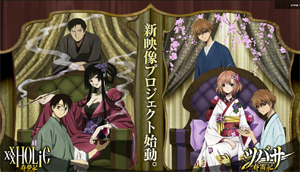 The official website for the Tsubasa and XXXHOLiC OADs has a new illustration on its homepage, check it out! I used to think (based on rumors I heard several years ago) that CLAMP’s own birthday was on April 1st, but I was never completely sure of that given that there was no official info to base on. Now, with the new addition on CLAMP-NET.COM that traces their time-line, it’s possible to see that the first chapter of RG Veda was published in March, not April. They don’t give specific dates, though. The thing is, I don’t think CLAMP themselves know the date xD However, it’s very clear that they love this date, April 1st, therefore, I consider it as a very CLAMPy day. Lastly, lastly! I forgot to mention it yesterday because I was so excited with CLAMP-NET.COM’s new layout, but I’ll say it now. I would like to deeply thank everyone who voted or somehow gave me support on my cover at the CLAMP Fanbook contest! I won! So I want to share this victory to everybody to helped for it! Thank you all so much, specially to all of you who voted without knowing the cover was mine! The official website of the XXXHOLiC and Tsubasa OADs has been updated with promotional videos for both episodes! I downloaded the FLVs and uploaded them to YouTube myself, how come I didn’t think of that sooner? LOL! For anyone interested, XXXHOLiC Shunmuki PV and Tsubasa Shunraiki PV on YouTube. XXXHOLiC’s one looks much better than Tsubasa’s, in my opinion, whose animation quality looks lower than Tokyo Revelations. A week ago I made a post supposedly revealing which member of CLAMP was sick. By then we thought it was Tsubaki Nekoi but a reader has approached me to inform that there was a mistake in the translation. I asked the original translator to take a look at the translation and indeed there was a mistake. Around the same time, Nanase Ohkawa made a post in her Private Board clearly revealing that she was the one who got sick. You can read the post where she talks about her illness after the cut.